In general, DL is at higher frequency band and UL is at lower frequency band in order to reduce the UE’s transmission power. 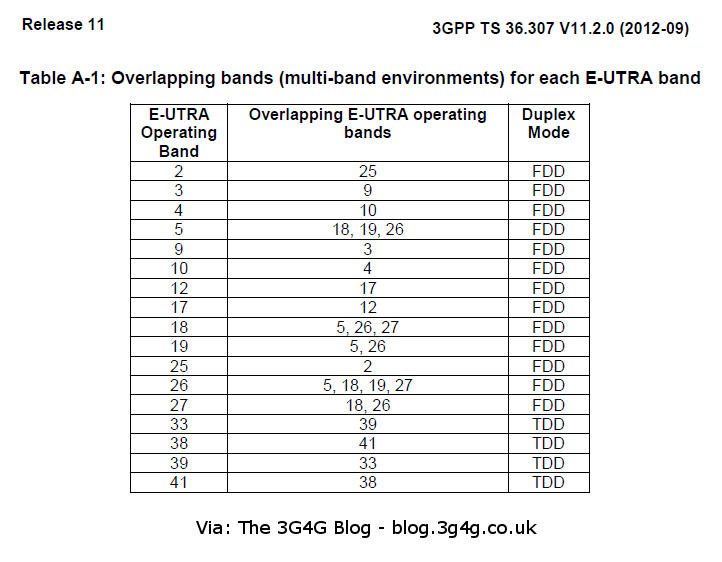 However, in LTE R10, four bands (B13, B14, B20, B24) are allocated by the following principle: UL is at higher frequency band and DL is at lower frequency band. What is the reason? I have a post on Band 13 mystery here. Similar reasons may apply to other bands, I haven't looked at them separately. Can you please explain a usecase where network can use MBFI FGI reported by UE? Also in the example, you mentioned the wider band usage by the new UEs so does that mean a usecase where the RB allocations will be affected? Rishi, I have explained the 2 examples of Sprint and AT&T. This is more at RF level and does not affect RB in any way. Its basically telling the UE that you are a camped on multiple bands even though the UE may think its camped on one of them. Thanks Zahid, this clarified few of my doubts. One more doubt. Let's say BAND X and Y are the overlapping bands and the network is configured with X but the UE supports band Y. If UE is coming to this network then what is the importance of the FGI bit provided in the UE capability. How does it affect UE or network if the network admits the UE without checking the FGI reported by UE? "An example could be Sprint that used Band 38 TDD (BW 50MHz) for its legacy devices but is now able to use Band 41 (BW 194MHz) as well. The legacy devices may not work on Band 41 but the new devices can use much wider band 41. So the transmission would still say Band 38 but the new devices can be informed of Band 41 using the System Information Block Type 1." Here Sprint is informing the new devices that you are on Band 41 which is superset of Band 38. Legacy devices dont support band 41 so it has to keep transmitting band 38. UE checks the band before camping. If it does not support, it wont camp.